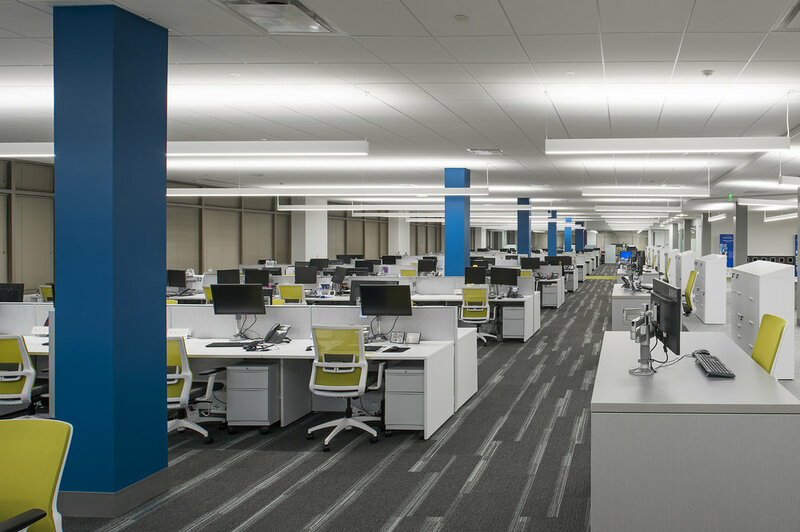 Ashfield Healthcare moved their US headquarters to approximately 85,000 RSF of space at 1100 Virginia Drive. Goals for the project included creating a cohesive and contemporary experience that aligned with UDG’s global brand standards. The space consists of standard administrative office space and very specialized call center space, along with amenity spaces and necessary support spaces. Architecturally, the goals were to introduce light, and create an open and flexible work environment that instilled a sense of community. The use of Ashfield’s penrose logo served as an inspiration to define space and connectivity throughout the office. This symbol, a visual identity the company's structure and organic nature, allowed us to create a multi-faceted space through angular forms introduced in wall and ceiling elements, floor finishes and light fixtures. Furniture was used to introduce Ashfield’s brand colors and serve as a wayfinding element throughout the space.